SOAW Border Convergence marchers approach the US/Mexico convergence stage, October 8, 2016. 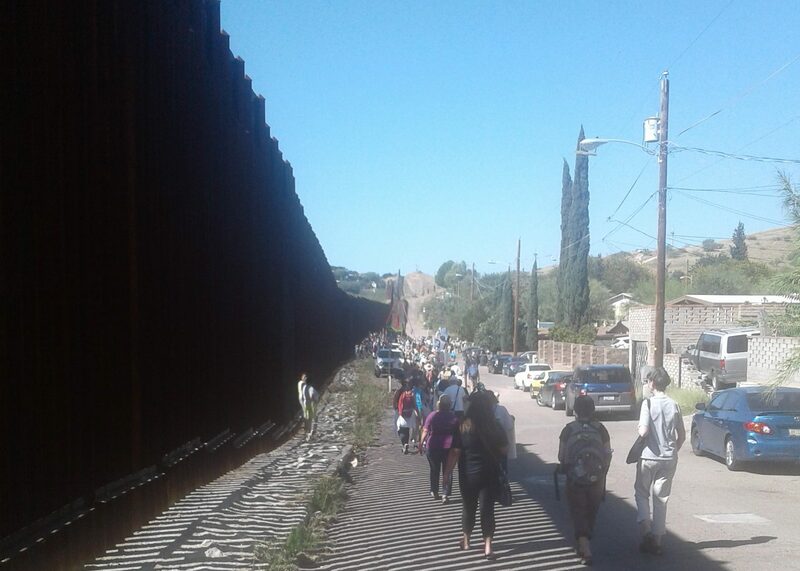 October 2016: I’m crossing the border to Nogales, Arizona, US by foot, returning from a brief visit to Nogales in Sonora, Mexico, following the SOAW Border Convergence. A tall rusty steel border fence, maybe 20-25 feet tall, lines the border in both directions as far as I can see, dotted occasionally by even taller surveillance towers. While my entry to Mexico was a matter of walking in, I stand in a line for 45 minutes to re-enter the US. We’re waiting to present our passports, which are scanned and examined closely, get questioned by Border Patrol agents, and perhaps be sniffed by large Border Patrol dogs. I’m white and a US citizen, so I pass through easily, but I wonder about how easy it is for the Mexican citizens who travel between countries regularly to see friends and family, and to shop. President Trump’s January 25, 2017 executive order to begin planning for a new US/Mexico border wall wasn’t a surprise to most people who were paying attention during the campaign. However, the extent of militarization at the southern border may surprise you—if you don’t live in a border state. Although Trump sometimes portrays the borderlands as a lawless, wild region in need of control, over 670 miles of the 1,900-mile border between the US and Mexico are already walled or fenced off. The border is already patrolled by a heavily armed and armored Border Patrol. Thousands of undocumented immigrants end up in detention centers each year, and hundreds die in the desert each year trying to make it to a better life in the US. The Secure Fence Act of 2006 was to fund 700+ miles of a double-fence border barrier, ostensibly to help prevent undocumented immigration. The built fence, however, was about 670 miles long, cost over $2.4 billion, and in many places (like Nogales) consisted of a single fence. Its primary function was to divert undocumented immigrants into the more dangerous open desert. 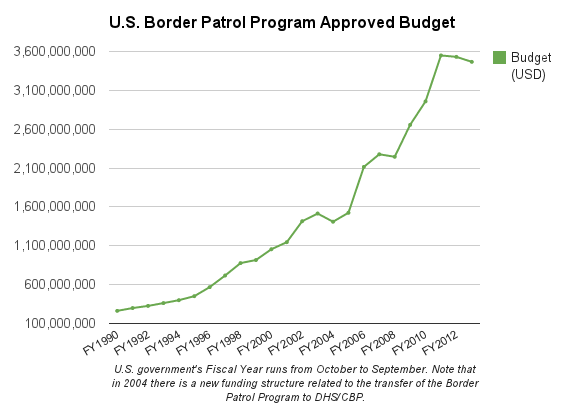 In addition, the government began to ramp up immigration enforcement within a 100-mile border zone sometimes called the “Constitution-free zone.” The Border Patrol budget increased sharply as a result (see the graph to the left). Border militarization was also increased through the Secure Communities program (active 2008-2014, and now revived by a Trump executive order). But thousands of people have died in the southern border area trying to make it to better lives in the US anyway. Border security doesn’t just affect immigrants and travelers. The Tohono O’odham people have not been able to freely visit members of their own indigenous nation in Mexico for several years. The Tohono O’odham reservation in the US is occupied by Border Patrol checkpoints, surveillance towers, and armed Border Patrol agents who search for traveling undocumented immigrants and harass locals. Many of the programs and trends begun during the Bush administration continued during Obama’s. Some immigrant rights activists have called President Obama the “deporter-in-chief,” because his administration had the largest number of formal removals of undocumented immigrants of any presidential administration, even as the number of people crossing the border was decreasing. In fact, in FY 2012, the budgets for CBP and ICE combined exceeded the collective budgets of all other federal law enforcement agencies (cited in Border Militarization Policy). Although comprehensive immigration reform was an issue of much discussion during the terms of Presidents Bush and Obama, Congress was not able to pass a bill. Proposed comprehensive immigration reform bills included both a route to citizenship for some undocumented immigrants and increased border militarization. President Trump is now calling for extending the border wall across the entire 1,900-mile length of the US/Mexico border. 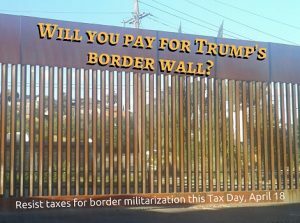 Recent estimates put the cost of such a wall at anywhere from $21.6 billion to as much as $40 billion. His administration consistently demonizes immigrants and refugees, portraying them as a danger to US residents. But many are fleeing wars, paramilitary violence, and poverty that are, in part, caused or facilitated by the United States (see for example: Syria, Iraq, Mexico, El Salvador, Guatemala, Nicaragua, and Honduras).